In 2004, the The Walter Burgess Scholarship was established by the Parkway Running Club (PRC) of West Roxbury, MA to honor a very special member, Walter Burgess. 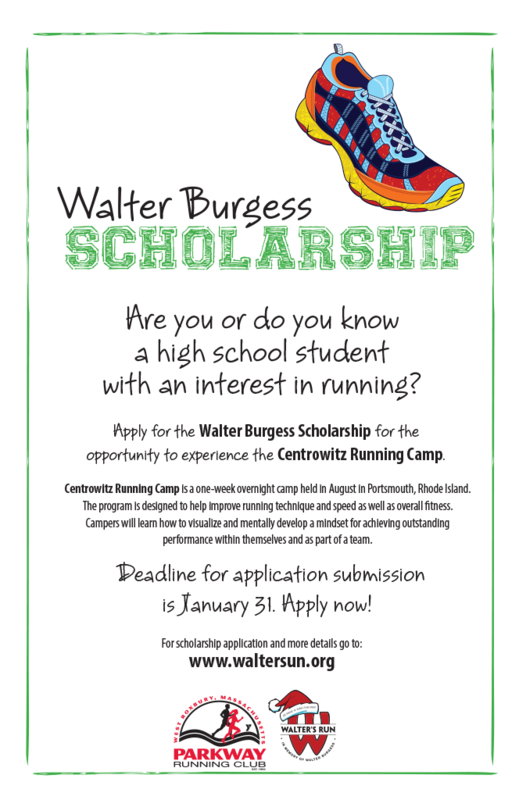 Funds from this scholarship are used to send deserving young runners (we call them Walter’s Gang) to the Centrowitz Running Camp in Portsmouth, RI. To date, a total of 99 young runners have received running camp scholarships in Walter’s memory. Read their notes of appreciation. Walter passed away suddenly in November of 2003, at the age of 40 shortly after completing the Great Floridian Ironman Triathlon. Walter was the PRC’s Secretary and newsletter editor. He was an amazing athlete in his own right, forever working out either at the Y, on his bike, or running on the roads. A U.S. Navy Veteran who participated in several overseas operations, Walter was a devoted son, brother and friend. He was an inspiration to those who were privileged to know him. Walter was an enthusiastic participant at the Newport Running Camp (now the Centrowitz Running Camp) from 1994-2002. He regretted missing camp in 2003 because he was traveling and training for his Ironman Triathlon. He vowed to return to the camp in 2004 and never was able to do so. A modest, sincere individual, Walter would be touched and proud to support the development of young runners as part of his legacy. Deadline for application submission is January 31, 2019. APPLY NOW! Please note: The Parkway Running Club will hold the annual Walter’s 5K Road Race this year on Sunday, December 9th, 2018 at 11am at the YMCA in West Roxbury. We encourage scholarship recipients and campers to participate. For more information, contact Dorothy Giarla of the PRC (183 Beech Street, Boston, MA 02131 or scholarship@waltersrun.org. Additional questions / comments? Contact us. Centrowitz Running Camp is a camp that is friendly to runners of all ages and experience. Campers will learn how to visualize and mentally develop a mindset for achieving outstanding performance within themselves and as part of a team. The program is designed to help improve running technique and speed as well as overall fitness. The camp is located a Portsmouth Abbey School — a first-rate running facility with multiple fields on which to train as well as a six-lane track, state-of-the-art fitness center, tennis courts, two gymnasiums, and a stunning 500-acre campus along the shores of Rhode Island’s Narragansett Bay. Program participants will be housed in dormitories with three meals a day prepared on site. The daily schedule will be structured to take full advantage of coaching and staff expertise. There will also be ample “down time” for recreational and evening leisure activities. The camp is coached by Collegiate and High School coaches. Matt Centrowitz “the elder” is the camp director. He won four consecutive U.S. 5,000-meter titles from 1979-82, the 1979 Pan Am Games 5,000 gold medal and set the American record in the event. He missed the 1980 Olympics in Moscow due to the U.S. boycott. The “younger” Matt Centrowitz placed fourth at the London 2012 Olympics in the 1500 meter race and medaled in the 1500 meters in the 2011 and 2013 World Championships. Centrowitz just won the 2016 World Indoor Championships 1,500-meter run, becoming the first U.S.-born male to win a World Outdoor, World Indoor or Olympic gold medal in the metric mile since 1908. Matthew attended camp since he was a boy so it shaped his career and he became an Olympian. For more information on the camp, see links above or contact Camp Co-Director Nate Kraft at centrowitzrunningcamp@gmail.com or 202-997-2689. Please say you are inquiring about attending camp on the Walter Burgess Scholarship.